The Florsheim house is a timeless classic and a time capsule that recalls Palm Springs of the 'fifties: a compact resort where you could enjoy an uninterrupted view of desert and mountains. One of Julius Shulman's iconic images, of Richard Neutra's 1947 Kaufmann residence, implanted that sense of isolation and natural wonder in the public consciousness. He returned as a nonagenarian in 2005 to shoot the Florsheim house, which he called "as beautiful as it is romantic, and quintessentially Palm Springs". As the Shakers declared, "tis a gift to be simple," and understated modernism is the signature style of Palm Springs: an inspired response to climate, topography, and casual indoor-outdoor living. Donald Wexler was one of several young architects who gravitated to this embryo city, establishing his practice here in 1954, and enjoying a prolific fifty-year career designing every kind of building. Still working as a consultant, he has stayed close to home in the Coachella Valley, and is best-known for the municipal airport, and his inventive use of prefabricated steel framing for houses and his thirty local schools. Large-scale commissions crowded out residential work, and that makes his houses all the rarer and more desirable. The Alexander Steel Homes of the 1960s are covetable landmarks, but the earliest houses are among his best and most personal creations. The 'fifties was an era of optimism and prosperity. America had emerged from the Great Depression and triumphed in battle; now it was time to look forward and create a brave new world. The Case Study House program was a showcase of rational design, furnished with the practical lightweight furniture of Knoll, George Nelson, and the Eames Office. Raymond Loewy's inventive spirit was embodied in the Avanti car, and the house he commissioned from Albert Frey, an architect who had worked with Le Corbusier. That idealistic era was short-lived, but some of its spirit lingers on in Palm Springs and in the Florsheim residence. From within its white walls, you see nothing but rocky peaks and a frieze of palm trees sharply etched against the blue sky. The house seems to hug the ground and flow into space. It's oriented north-south to conserve energy, and its projecting roof planes shade the glass sliders on those two sides. Solid walls block the sun to east and west, and interior courtyards, landscaped with rocks, pebbles and feathery bamboo, filter natural light. What you see today is a meticulous recreation of Wexler's original, stripped of unsightly additions. Working from his plans, the last owners restored its openness and clean lines, while upgrading the kitchen and bathrooms. They kept the white terrazzo floor that shimmers in the diffused sunlight, and the mirrored closets that double the apparent size of the bedrooms at front and back. The warm tone of Douglas fir ceilings complements the white walls, and exposed joists create a strong sense of axiality. Luis Ortega furnished the interiors and outdoor living room to subtly enhance the architecture. Marcello Villano created a drought-resistant landscape in the stepped pool court to the south, and the tightly enclosed space to the north, where you are lulled by the cooling murmur of a fountain. Ficus hedges grow over the white-washed bricks, and wooden spider-legs support a canopy over the walkway to the entrance. 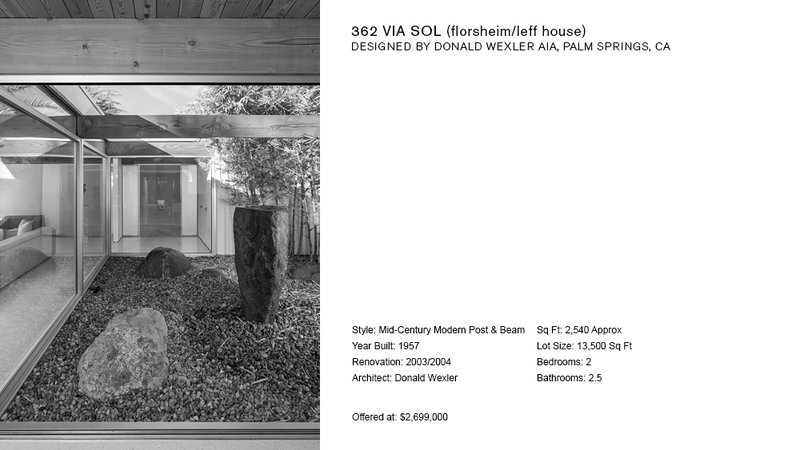 As a graduate from a progressive architecture school, Wexler completed his education with a nine-month apprenticeship in the LA office of Richard Neutra--the Austrian emigr� who, along with his compatriot Rudolph Schindler, adapted European modernism to southern California from the 'twenties on. He described his crisp white cubes as "machines in the garden," and Wexler picked up on that idea. Like his contemporaries, Wexler realized that the contrast between a sharp-edged house and the rugged desert intensified the experience of both. The Florsheim house is elemental yet refined, sheltering while liberating, intimate yet seemingly infinite. In its purity of line, smooth surfaces, and impeccable details, it's a place to dream in and about.